Building on the strategic alliance between Amazon Web Services and Salesforce, we are excited to announce the first release of the Amazon Connect Computer Telephony Integration (CTI) Adapter for Salesforce. Amazon Connect is designed as a highly scalable, self-service, cloud-based contact center service that makes it easy for any business to deliver better customer service at lower cost. 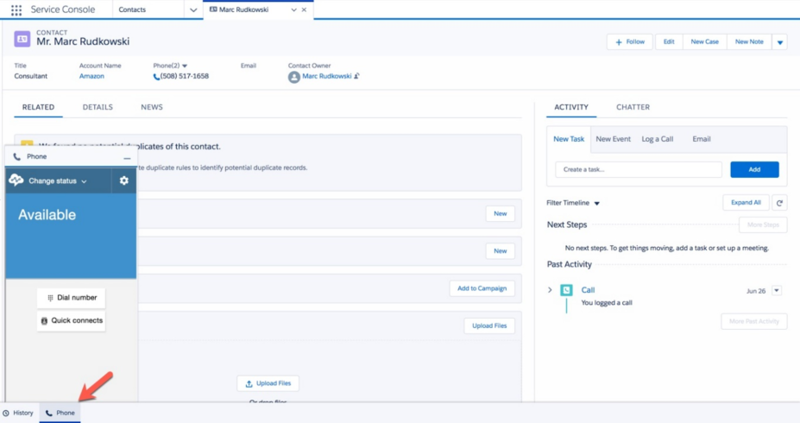 Salesforce Service Cloud empowers agents on the path to customer success with smarter and faster service tools. 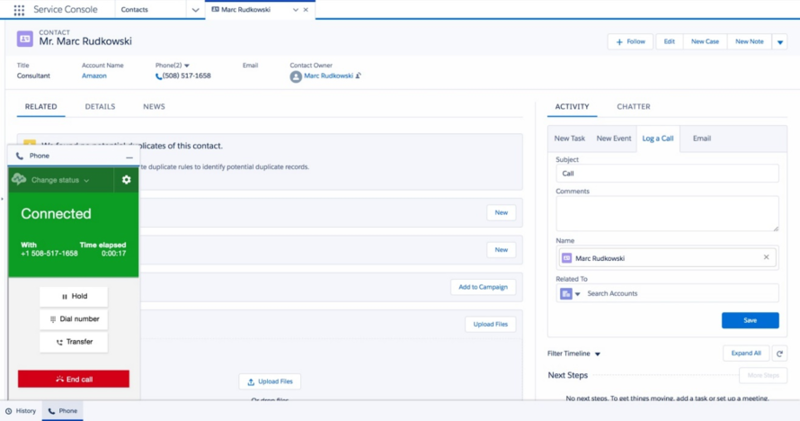 Now, the Amazon Connect contact center service and Salesforce’s customer relationship management (CRM) work together to provide the essential foundation for your organization’s customer service experience. This helps support integrated customer workflows between interactive voice response (IVR), automatic call distributor (ACD), and CRM – all critical to contact center strategies. The Amazon Connect CTI Adapter is the first release of the package that is designed to provide complete cloud-based integration and workflow capabilities between Amazon Connect, Salesforce Service Cloud and Sales Cloud. 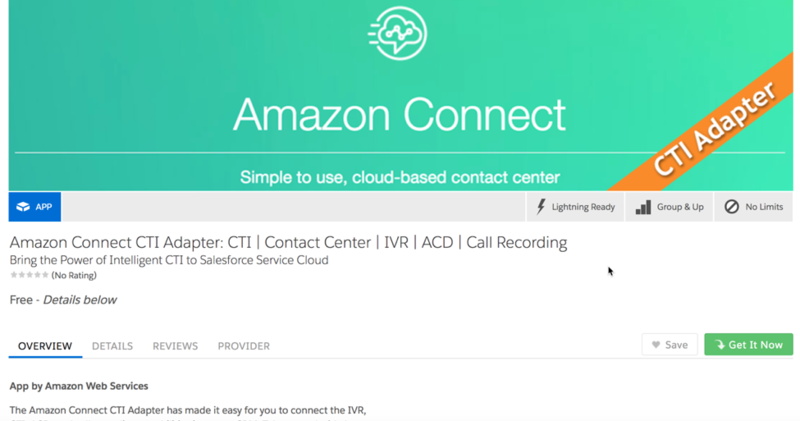 The Amazon Connect CTI Adapter provides a WebRTC browser-based contact control panel (CCP) within the Salesforce Lightning, Console, and Classic CRM experience. This CTI integration gives your agents the ability to leverage both inbound caller ID screen pop-ups and outbound click to call/transfer/conferencing. If you have not spun up an Amazon Connect instance, take a look at our Getting Started Guide. The Amazon Connect CTI Adapter integration leverages both the Amazon Connect Streams API and the Salesforce Open CTI API. 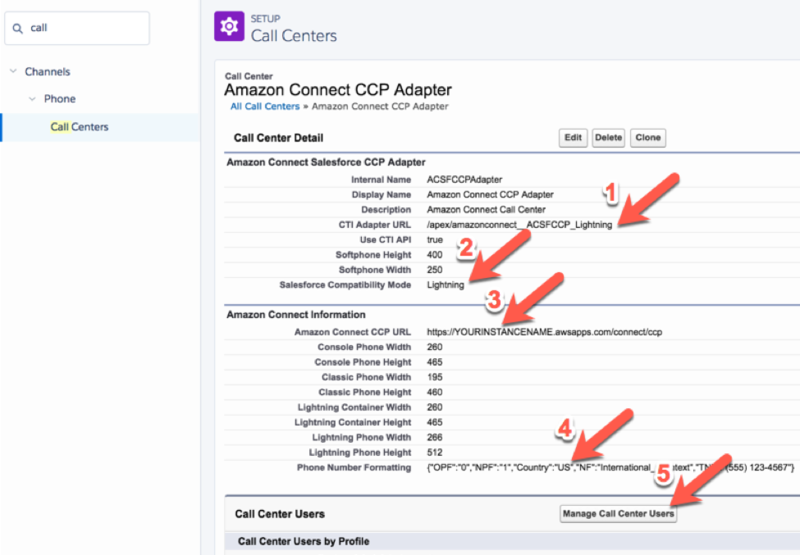 In this blog post, we’re going to focus on setting up the Amazon Connect CTI Adapter for Lightning experience. You can follow the setup instructions for enabling the CTI Adapter for the Salesforce Classic and Console experience. We recommend you initially install the package into your Salesforce sandbox. The suffix for the Amazon Connect CTI Adapter URL is set to Lightning. If you were configuring the Amazon Connect CTI Adapter for Classic or Console, those suffixes would be used instead. Salesforce Compatibility Mode is set for Lightning. This would be set to Classic if you were configuring for Classic or Console. The Amazon Connect CCP URL is set to your Amazon Connect instance name. (replace YOURINSTANCENAME with your Amazon Connect instance name). If you are using this in another country (i.e. Great Britain), set the appropriate two digit ISO country code. Provide access to users (i.e. admins, supervisors, agents) who will be using the CCP. At this point, you have properly configured your Salesforce instance. The next step is to whitelist your Salesforce Visualforce domain within your Amazon Connect’s Application integration. This is required from a security perspective to ensure you are allowing cross-domain access to your Amazon Connect instance. More information about whitelisting can be found on the Amazon Connect Streams documentation. If you’re unsure of the Salesforce Visualforce domain, or if it is getting blocked by Amazon Connect, you can find it by previewing the URL of the Amazon Connect Visualforce page within your Salesforce instance. Now that you have everything configured, let’s give this a go. Open your Chrome or Firefox browser and login to your Amazon Connect instance (https://YOURINSTANCENAME.awsapps.com/connect/login). 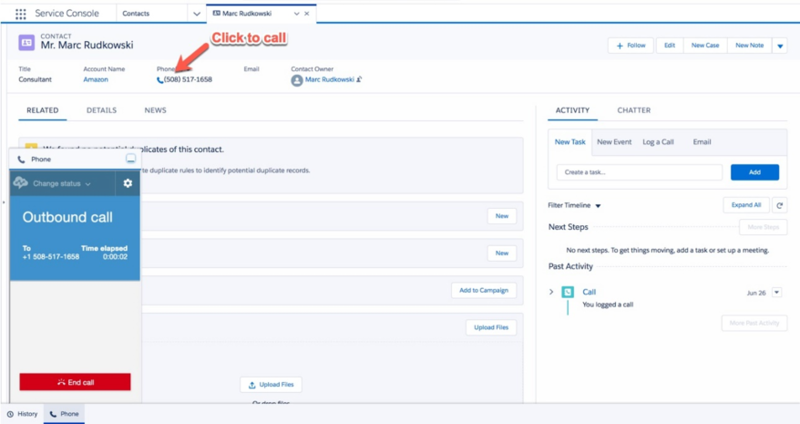 Open another tab and log into your Salesforce CRM instance and go to your Sales or Service Console Lightning application. If you are not seeing the phone icon or an empty pop-up, take a look at our troubleshooting guide in the setup instructions. You should notice that all numbers have a phone icon next to them. At this point, you can leverage the click-to-call capability when you press the icon or number. It will make an outbound call via the Amazon Connect CCP and connect to the customer when they answer the call. Once you complete the call, the Amazon Connect CCP will go into AfterCallWork status where the agent can perform any follow up activities (e.g. logging a call). After these activities are completed, they can make themselves available to take more calls. 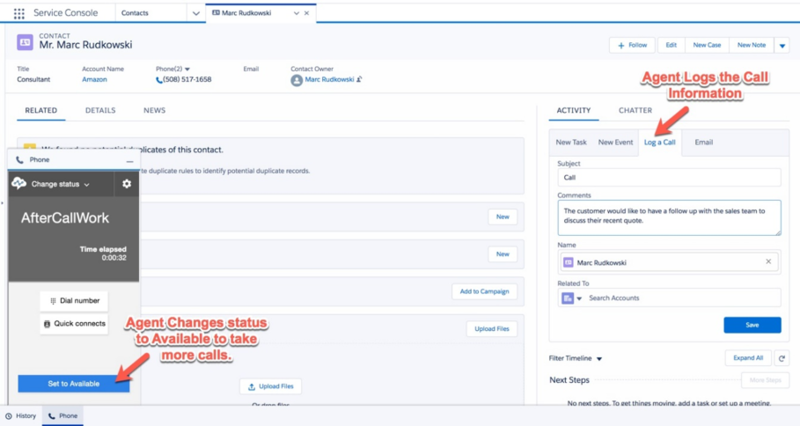 If the agent is in an available state and they receive a call, the inbound call will screen pop the Amazon Connect CCP and any matching records for the caller ID. 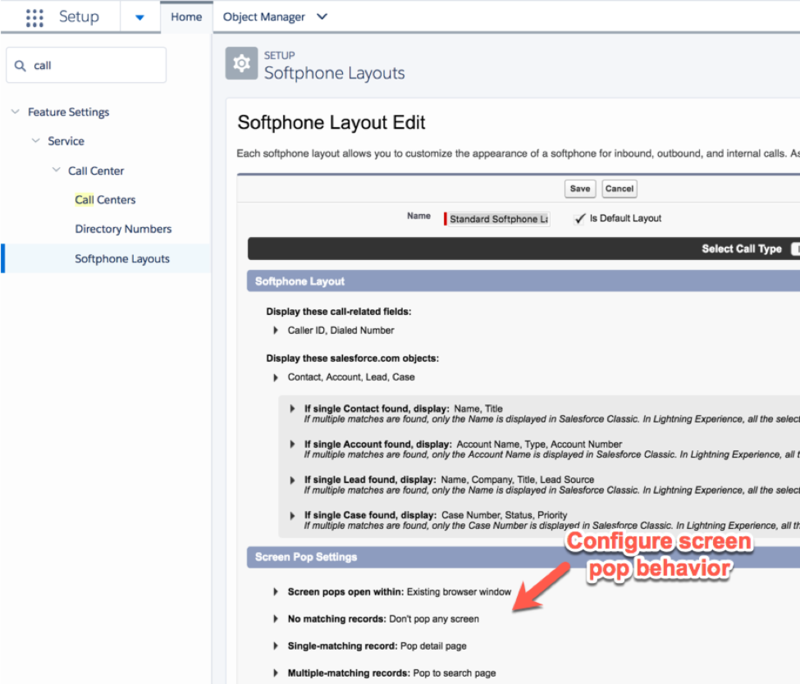 You can also configure the screen pop behavior in the Softphone layouts under your Salesforce call center configuration. This is the first release of the Amazon Connect CTI Adapter for Salesforce. More features are coming soon as AWS determines how to best provide more integrated capabilities with Salesforce Service and Sales Cloud. Please try out the Amazon Connect CTI Adapter and open a case with your feedback. We value your input because it will help us define our next set of features. For more information also refer to last March press release.